Children and the Internet: What are "safe" websites telling our kids about food? This conference paper was originally published as Jones, SC and Fabrianesi, B, Children and the Internet: What are "safe" websites telling our kids about food?, Proceedings of the Social entrepreneurship, social change and sustainability: International Nonprofit and Social Marketing Conference, Brisbane, 27-28 September 2007. Food advertising is a contentious issue in regards to childhood obesity and has increasing importance on the public policy agenda both in Australia and overseas. 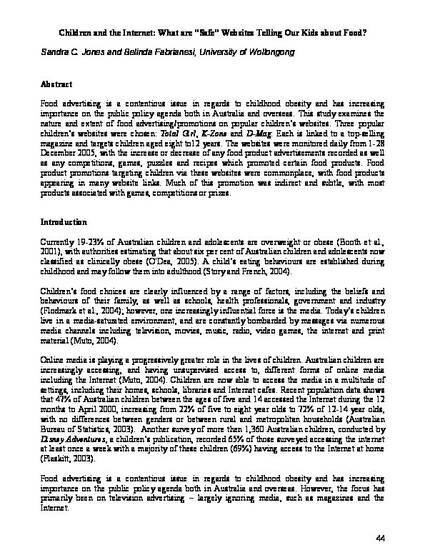 This study examines the nature and extent of food advertising/promotions on popular children’s websites. Three popular children’s websites were chosen: Total Girl, K-Zone and D-Mag. Each is linked to a top-selling magazine and targets children aged eight to12 years. The websites were monitored daily from 1-28 December 2005, with the increase or decrease of any food product advertisements recorded as well as any competitions, games, puzzles and recipes which promoted certain food products. Food product promotions targeting children via these websites were commonplace, with food products appearing in many website links. Much of this promotion was indirect and subtle, with most products associated with games, competitions or prizes.